Scientists have concluded that atomic clocks have reached the necessary degree of precision to provide the most direct measurement of the geoid – the Earth's true physical form. It will also be possible to combine atomic clocks measurements to existent geophysical methods to explore the interior of the Earth. Today, the Earth's geoid – the surface of constant gravitational potential that extends the mean sea level – can only be determined indirectly. On continents, the geoid can be calculated by tracking the altitude of satellites in orbit. Picking the right surface is a complicated, multivalued problem. The spatial resolution of the geoid computed this way is low – approximately 100 km. An international team headed by astrophysicists Philippe Jetzer and Ruxandra Bondarescu from the University of Zurich is convinced that ultraprecise portable atomic clocks will identify Earth's true shape as well as mineral deposits or concealed water resources within the planet in the next decade. Using atomic clocks to determine the geoid is an idea based on general relativity that has been discussed for the past 30 years. Clocks located at different distances from a heavy body like our Earth tick at different rates. Similarly, the closer a clock is to a heavy underground structure the slower it ticks – a clock positioned over an iron ore will tick slower than one that sits above an empty cave. "In 2010 ultraprecise atomic clocks have measured the time difference between two clocks, one positioned 33 centimeters above the other," explains Bondarescu before adding: "Local mapping of the geoid to an equivalent height of 1 centimeter with atomic clocks seems ambitions, but within the reach of atomic clock technology." According to Bondarescu, if an atomic clock is placed at sea level, i.e., at the exact altitude of the geoid, a second clock could be positioned anywhere on the continent as long as it is synchronized with the first clock. The connection between the clocks can be made with fiber optics cable or via telecommunication satellite provided that the transmission is reliable enough. The second clock will tick faster or slower, depending on whether it is above of beneath the geoid. The local measurement of the geoid can then be combined with other geophysical measurements such as those from gravimeters, which measure the acceleration of the gravitational field, to get a better idea of the underground structure. In principle, atomic clock surveying is possible to great depth provided that the heavy underground structure to be studied is large enough to affect the tick rates of clocks in a measurable manner. 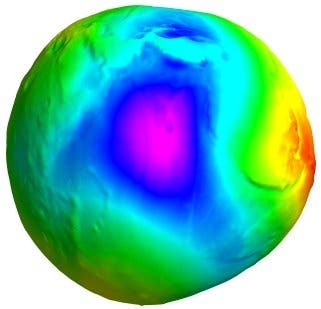 The smallest structure that atomic clocks accurate to 1 centimeter in geoid height can determine is a buried sphere with a radius of about 1.5 kilometer buried at 2 kilometers under the surface provided it has a density contrast of about 20% with the surrounding upper crust. However, scientists estimate that the same clocks would be sensitive to a buried sphere with a radius of 4 kilometers at a depth of about 30 kilometers for the same density contrast. Currently, ultraprecise atomic clocks only work in labs. In other words, they are not transportable and thus cannot be used for measurements in the field. However, this is all set to change in the next few years: Various companies and research institutes, including the Centre Suisse d'Electronique et de Microtechnique CSEM based in Neuchâtel, are already working on the development of portable ultraprecise atomic clocks. "By 2022 at the earliest, one such ultraprecise portable atomic clock will fly into Space on board an ESA satellite," says Professor Philippe Jetzer, the Swiss delegate for the STE-Quest satellite mission aimed at testing the general relativity theory very precisely. As early as 2014 or 2015, the "Atomic Clock Ensemble in Space ACES" is to be taken to the International Space Station ISS. ACES is an initial prototype that does not yet have the precision of STE-QUEST.